The use of Breedplan EBVs is the most accurate method of comparing animals for production traits such as Growth, Milk, Muscle, Finish etc. as they remove the bias caused by variations in environment and management that do not have any bearing on how an animal will breed. Santa Gertrudis Group Breedplan is now calculating EBVs for up to 14 economically important traits. While this provides a comprehensive range of genetic information, it also results in the dilemma of knowing which traits to put the most emphasis on for a specific, commercially focused breeding program. BreedObject $Indexes rank animals for a single selection goal – profit. Index creation involves a couple of logical steps that combine economics with genetic selection. Economic values for performance measures are calculated for a given herd’s production system and target market. Using some tried and tested genetic theory, these economic values are then used to calculate appropriate weightings for the available Breedplan EBVs. BreedObject uses all available EBVs for an animal with economic weightings relating to a given market to produce a single $ value. By combining all available growth, carcase and fertility information, BreedObject $Indexes rank animals from most profitable, specific to a particular market, and provide a single EBV that reflects the value of an animal, to your breeding objective in dollar terms. Weightings are calculated to account for antagonisms between traits and for long term effects of selecting for “cost traits” such as growth and leanness which may eventually lead to decreased cow fertility or increased cow maintenance. 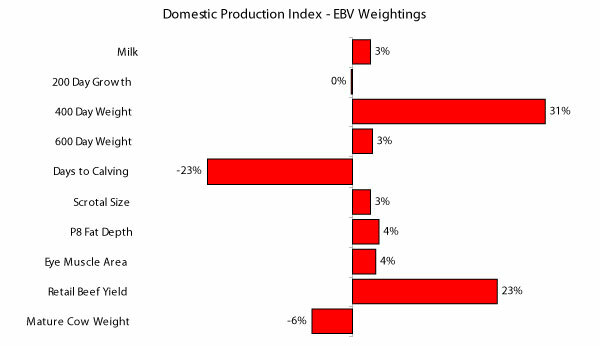 These weightings apply selection pressure to the right EBVs to achieve the greatest long term herd profit. 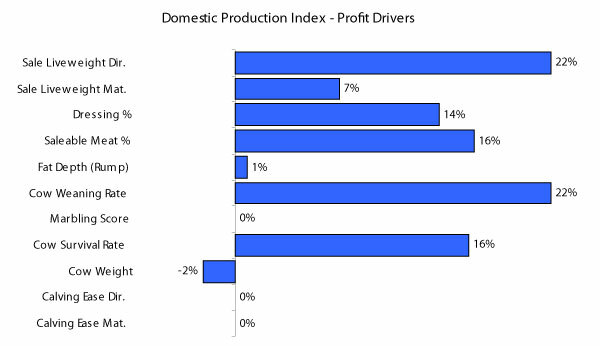 Domestic Production $Index (Domestic) estimates the genetic differences between animals in net profitability per cow joined for an example self replacing commercial herd targeting pasture grown and finished steers for the domestic trade. Steers are assumed marketed at 500kg live weight (280kg HSCW and 12mm P8 fat depth) at 16 months of age. Figure 2: % emphases on individual EBVs for the Domestic Market. 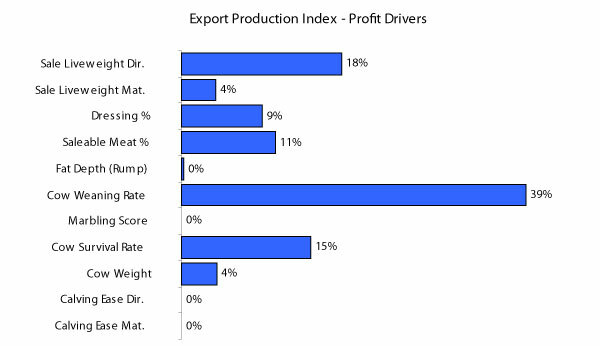 Export Production $Index (Export) estimates the genetic differences between animals in net profitability per cow joined for an example self replacing commercial herd targeting pasture grown and finished steers for export. Steers are assumed marketed at 620kg live weight (340kg HSCW and 15mm P8 fat depth) at 28 months of age. The two indexes are primarily driven by three dominant EBVs – Days to Calving, Growth (400-Day for Domestic Index and 600-Day for Export Index), and Retail Beef Yield. Secondly, different Growth EBVs (400 and 600 Days) are targeted due to the different turnoff ages. Mature Cow Weight is negatively correlated with profitability in Domestic Production primarily because of cow maintenance requirements and the fact that fast growth to the low turnoff weight is the prime objective. On the other hand, Mature Cow Weight is slightly positively correlated to profit in Export Production because animals need to have the ability to grow to higher weights. Thirdly, fertility, in the form of Days to Calving and Scrotal Size, is a major profit driver for both production systems. 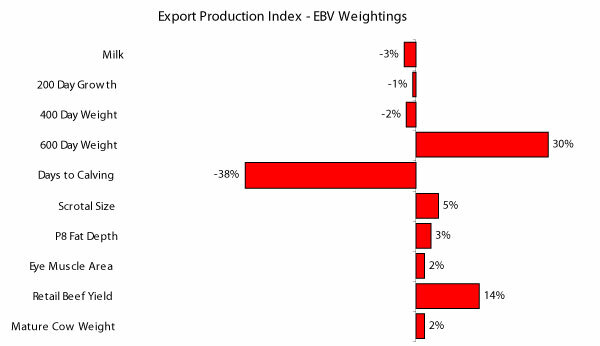 You will notice that more emphasis is placed on fertility in Export Production. This is primarily because it is assumed that operations targeting this market are generally in more tropical areas where the environment is more limiting. In such environments, it is believed that herd fertility and hence profit can be influenced more through genetic selection than in the temperate areas. The Retail Beef Yield % EBV represents the total (boned out) meat yield as a percentage of a dressed carcass. The RBY% has a bigger influence on profit in Domestic than in Export Production because leaner carcasses with less waste are desired. With fertility being such a profit driver, the Santa Gertrudis Performance Recording sub-Committee has held off creating $Indexes prior to this because there has not been enough days to calving information recorded on the breed database. This information will increase in the future and the $Indexes will become even more accurate. $Index values reflect the long term value of an animal to a given breeding objective in dollar terms. They are very useful for sorting potential sires on profitability for your herd. Once you identify the top ranking bulls for your situation, it may be necessary to look at the individual EBVs for those bulls to ensure they have no weaknesses. For example, if you are having trouble getting enough fat cover on your bullocks, you may prefer to purchase bulls that have positive Fat EBVs and hence breed easier finishing progeny. This may mean that you reject some of the high ranking $Index bulls that have leaner body types. We are proud to be one of the first sales to offer $Index values in our catalogues. The balanced selection approach which is advocated by BreedObject is the direction we believe the industry must head. We also believe that the above information should be used in combination with visual appraisal for structure, temperament and conformation and vet assessment information to enable you to select a bull that best suits your situation.